In June 1998, just when Bahrain introduced new series notes, modifications to the notes that had been issued since 1993, a mighty confidence trick rocked the Bahrain Monetary Agency and threatened the stability of the Bahraini Dinar. A few mounts before that, several men successfully portrayed themselves as representatives of the Bank of Bahrain, presented a forged order for 20-dinar notes from the Bahrain Monetary Agency and a contract for Ciccone Calcografica (an Argentinian security printer based in Buenos Aires) to supply 20-dinar notes was subsequently signed on 13 January 1998. The notes were printed in May and June and big amounts notes were then shipped under control of the criminal gang to a number of countries in all the world. The process of identifying the forgeries was undoubtedly confused by the recent release of the 20-dinar note with the hologram. At the time the forgeries were being presented for payment, there were three types of 20-dinar notes in circulation – the 1993 issue (without the hologram), the 1998 issue (with the hologram), and the 1998 forgeries (without the hologram). On 8 June 1998 the Bahrain Monetary Agency issued a press release advised that the forgeries were not legal tender, but they could be exchanged at the commercial banks by individuals who had accepted them in good faith. Six days after, on 14 June 1998, the Bahrain Monetary Agency issued a second press release. After again stressing that the forgeries were not legal tender, the press release announced that, from Monday 15 June, the forgeries could no longer be exchanged at the commercial banks. Anyone presenting forged notes from this date did so ‘at his own risk and responsibility’. 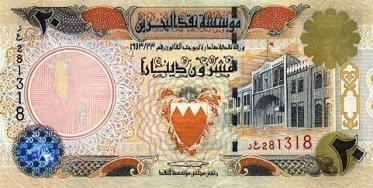 Bahrain ordered the withdrawal of all 20-dinar notes on 30 July 1998. Therefore, the 20-dinar note issued in June 1998, with the hologram, circulated for only six to seven weeks. 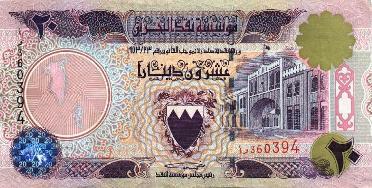 On 1 August 1998 the Bahrain Monetary Agency issued a new 20-dinar note, which was of the same pattern as the previous 20-dinar notes, issued in 1993 and 1998, but was peach-coloured instead of purple. The new notes carried the hologram introduced to the recently released, high denomination notes. Attention with the false ones! !